Dees Transit Center Manager Russell Davis (left) pictured with Ford Zone Manager Ryan Baker. Dees of Croydon Transit Centre recently held a Transit Show Live event at B&Q Croydon Store to mark the the celebration of 50 Years of the Ford Transit. It was in 1965, the same year that Prime Minister Winston Churchill passed away the very first Ford Transit hit the roads of Great Britain. In those 50 years since the Ford Transit has been the number 1 selling commercial vehicle in Britain . Today in 2015 the Ford Commercial Vehicle range has grown to include the Transit, Transit Custom, Transit Courier, Ranger Pickup and the Fiesta Van which has recently established a new UK sales record. 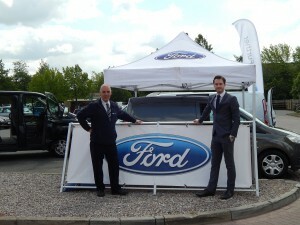 The Transit Show Live Event was a unique opportunity for members of the public to be able to explore and experience the latest innovative technologies in the current line up of Ford Commercial Vehicles.